2013 East Texas Blues Music Festival. East Texas is home to the T-Bone Walker Blues Music Festival in Linden Texas at Music City Texas Theater. This yearly event is always a crowd pleaser; people come from all over the country to this annual festival. 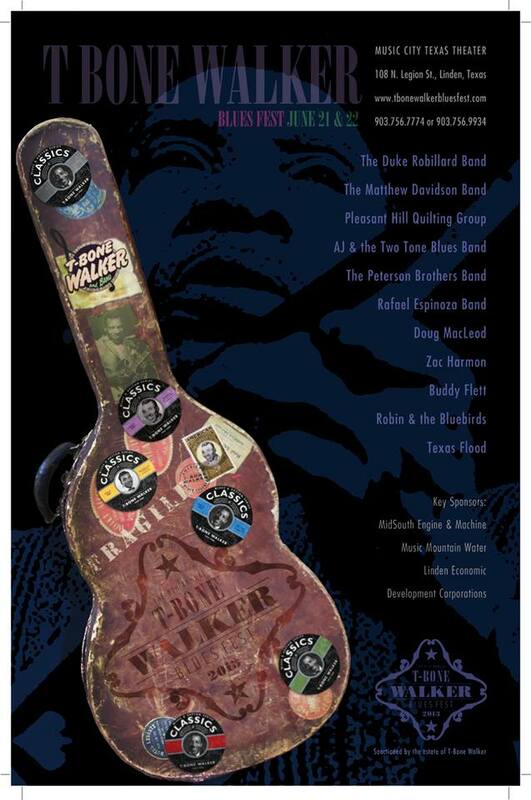 This Blues music concert honors the life of Aaron Thibeaux (T-Bone) Walker who was born in Linden, Texas in 1910. He went on to become a critically acclaimed American blues guitarist, multi-instrumentalist, singer and songwriter. And he was one of the most influential pioneers and innovators of the jump blues and electric blues sound. This June is the 8th year for this gathering of musicians playing blues music on instruments ranging from ukuleles to steel guitars. On Friday the outdoor performances starting at 7:00PM are free. You are encouraged to bring your lawnchairs and or blankets to enjoy the open air concert. This years headlining band is The Duke Robillard Band, taking the stage also is Doug Macleod, AJ & The Two Tone Blues Band, Mathew Davidson Band, Zac Harmon Band Rafael Espinoza Band, Peterson Brothers Band, Texas Flood, Robin and the Bluebirds and Buddy Flett and rounding out the event participants is the Pleasant Hill Quilting Group. You can find much more information at the T-Bone Walker website where you’ll find tickets, stage times and history. This entry was posted in Concerts by Tammy D. Bookmark the permalink.